Research suggests that professionals may find it difficult to detect sight loss in people with autism. 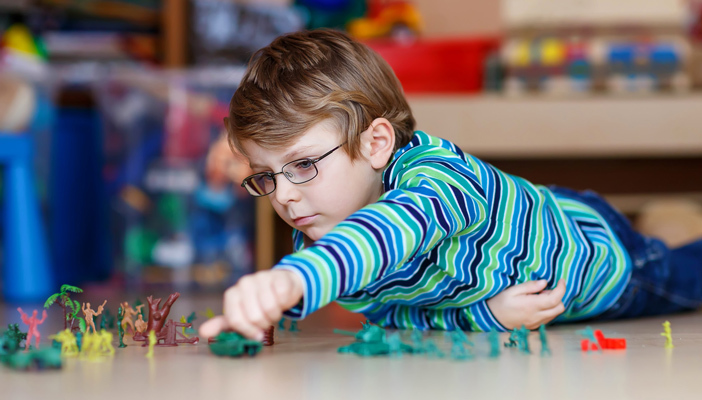 A systematic review of research evidence, published in the Review Journal of Autism and Developmental Disorders, found similar behavioural features associated with both autism and severe visual impairment in childhood. Delay in the development of symbolic play, and repetitive mannerisms such as rocking, and eye-poking and rubbing may indicate autism in childhood, but may also result from ophthalmic issues. If these behaviours are attributed to autism by practitioners and continue into adulthood it is possible that sight loss may be missed. Previous research has similarly found that difficulties in spatial awareness, light and contrast sensitivity and facial recognition can stem from sensory processing difficulties associated with autism, but may also indicate ophthalmic issues. The study, undertaken by RNIB Scotland, Scottish Autism and Edinburgh Napier University, found that there is not yet sufficient evidence to give a definitive idea of how pervasive vision impairment is among autistic people. It is therefore vital that individuals access eye health care so that any vision problems can be identified and appropriate support be given sooner. Anne McMillan, Adult Social Care Operations and Development Manager at RNIB, said: “Undiagnosed sight loss can have a serious impact on a person’s quality of life. RNIB's Complex Needs services have been raising awareness of 'hidden' sight loss, among groups who might not be able to communicate problems as easily as others like those with autism, for a number of years. When a person with complex needs has problems with communication their primary diagnosis may overshadow difficulties with their sight." As part of the Scottish Government’s Strategy for Autism, practitioners at Scottish Autism have received training from RNIB Scotland to improve vision awareness and support in services. The bespoke training programme, Bridge to Vision, comprises a one-day course to introduce practitioners to common vision issues, their impact on daily living, indicators of sight loss, and the need for regular sight tests. Practitioners who complete the first course can then attend a more in-depth two-day course to become a ‘Vision Champion’. Champions are taught to make systematic observations for referral to optometry and receive a toolkit for improving support and documentation for vision needs. Participants in the training reported an increased number of people they support attending eye tests, as well as more detail on vision issues in clients’ support plans. Vision Champions spoke of paying closer attention to supporting those with known vision issues, ranging from thinking carefully about light sources in a room, to changing venues for activities and repainting rooms to ensure clear contrast between walls and doors. The intention is to integrate RNIB Scotland’s Bridge to Vision education programme into Scottish Autism’s services. This will mean equality of access to eye health care and ensure that vision issues do not go undiagnosed in people with autism. For further information, please contact Ian Brown at RNIB Scotland on 0131 652 3164 or 07918 053 952.